I just got back from my local music radio show on internet only Wbkm Dot Org. Black Rabbit released a great new EP on Saturday and I featured a few songs. I used that to create a set of really rocking music! From our small city to the great big world, these are the Sounds Of Burlington. I’ve got some great new music to play tonight but I want to start with a song I heard at Signal Kitchen a couple of weeks ago, that I keep listening to again and again. This is The Globe by Landlady on WBKM, and this is Burlington’s Kind Of Music. Great song from Brad Searles and friends. I love the dwellers song and Gabrielle Douglas‘ voice. There is a new The Cush streaming, but I don’t have a copy to play yet. I will, the moment I do. I love the Globe. On Saturday Black Rabbit released a killer 6 song EP. This one rocks! Last Friday, I went to The Monkey House to see Phil Yates and the Affiliates, and The Mountain Says No. The show was over early enough to run to Radio Bean and catch And The Kids. They played a great show and that song jumped out at me. Thanks to Joe Adler for organizing the Burlington-North Hampton band exchange. Lindy used to always be the second band on at the Radio Bean Birthday party, and always rocked! Great song from road warriors When Particles Collide. Songs like Tarpaulin keep me going to see Black Rabbit again and again. Well, last week I played the last song on Dancing With The Big Guy. It’s time to start playing a new album all the way through, song by song, week after week. This is another classic Burlington album. This is the first song from Ninja Jane. Another great song that I’ve loved for a while, that is now recorded. Yea. Killer song from FSE, one of the heavy rock bands from the ’90’s. Same with the Spill song. Zola were always there rocking , when I needed a band. It will be fun to play the full album all the way through. I think this next song is misnamed and is really a cover. 14.) The Invisibles – Black Rabbit. Great song from Rabbit. Great Mission Of Burma cover by Ninja, and I think the Peg Tassey MUSIC song was really Is It My Body by Alice Cooper. I hope you enjoyed checking out the music of our town, let’s do it again next week, shall we? FAREED ZAKARIA, HOST: But first, here’s my take. To answer the question, what should America do in Iraq, we should try first to understand what’s going on in the region through a broader prism. If you would look to the Middle East 15 years ago you would have seen a string of strikingly similar regimes across the region, from Libya and Tunisia in the west to Syria and Iraq in the east. They were all repressive dictatorships. They were all secular in the sense that they did not derive their legitimacy from religious identity or authority. Historically they had been supported by outside powers. First the British and French, then the superpowers, which meant that these rulers were more about pleasing patrons abroad rather than carrying favor at home. And they had secure uncontested borders. Today across the region that structure of authority has collapsed from Libya to Syria, and people are reaching for their deeper, older identities — Shia, Sunni — distrusting that they would be safe under anyone else’s rule. In Iraq and elsewhere, no amount of American military power can undo this tidal trend and put Humpty Dumpty back together. Why did it happen? The old order was probably unsustainable. It rested on extreme suppression which was producing extreme opposition movements. It also rested on super power patronage. And then one super power collapsed and the others’ support dictators started wavering. The countries with significant sectarian divides and in which minority groups ruled — Iraq and Syria — became the most vulnerable. The Iraq war was the crucial trigger and the American occupation needlessly exacerbated sectarian identities rather than building national identities. But let’s be honest, Iraq’s Shia, like the Sunni Islamist of Syria had been brutality suppressed by dictators for decades. It is always going to be hard for them to sign up peacefully to share power with their former torementors. Maliki’s reign of terror against the Sunnis has certainly ensured that the Sunnis will never really trust him and they are likely never to trust the parties he represents to rule over them. As Washington supports the Baghdad government, it will have to be extremely careful not to be seen as taking sides in a sectarian conflict and to press for political reform and inclusiveness even as it offers Baghdad military support. But Washington should recognize that national harmony in Iraq, everyone singing Kumbaya, is highly unlikely. It needs a plan B. Call it an enclave strategy. The world might have to accept that Iraq is turning into a country of enclaves and work to ensure that these regions stay as stable, terror free and open as is possible. The Kurdish area, now bolstered by having captured the vital city of Kirkuk, is already a stable success story. It will be possible to work with countries like Saudi Arabia and Jordan to influence the Sunni groups in the middle of the country and purge them of terrorists and empower moderate Sunnis. Now there will be enclaves where ISIS and similar groups gain some strength. In these areas Washington will have to use drones, counterintelligence and occasional special forces strikes just as it does in parts of Afghanistan, Pakistan, Yemen, and Somalia. To scholar Joshua Landis’ pointed that during the first half of the 20th century, much of Europe, especially Eastern Europe, went from being multi-ethnic to monoethic. One-third of Poland was non-Polish before World War II. One quarter of Czechoslovakia was minorities. Then there was what Landis calls the great sorting out. The Middle East has been going through its own version of this process. America can’t stop a trend like this. What it can do is try to limit the fallout, support those who believe in reconciliation and protect itself and its friends. 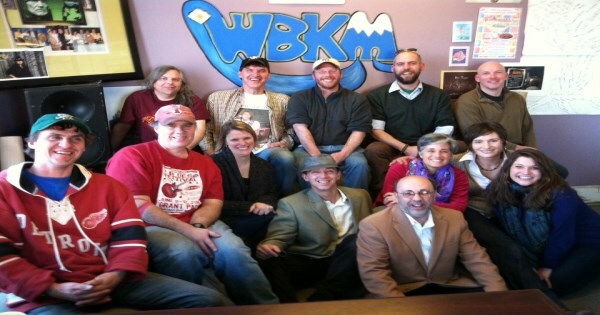 I just got home from my local music radio show on WBKM.ORG. I played a few new songs, including a song that is quickly becoming a favorite, and some classics. I played some future classics too. From our small city to the great big world, these are the sounds of Burlington. On Tuesday, I went to Signal Kitchen to see The Mountain Says No, and ended up loving the other two bands, too. This is the band who played in the middle and is the song they closed with. This is Above My Ground by Landlady on WBKM, and this is Burlington’s Kind of Music. I love that song and can’t wait for a full sounding version of it. They were great at Signal Kitchen and will be at The Monkey House tomorrow. Vultures is the first song that caught me on the St Rich album. I loved their show. It’s summer in Vermont and twilight at quarter after 9. It’s warm and time to head to the beach. I finally bought the ATK ep and Wiser jumped out. On the way down I listened to a bit of a song from a band at Red Square, I think, called 6:19. It looked like Jeremy Gartner from Wave with Matthew Bryan Hagen and Kevin Lynam from Lendway, plus keyboard, and violin. It sounded a bit like if Lendway played a Small Town Movie bluesy The Cush sort of song. Lendway are so cool, and Wave so bouncy and fun. Beach features Raph Worrick and Jane Boxall. Up next, it’s time to finish off Dancing With The Big Guy. This is a rocker! 12.) Jan Michael Vincent – Chin Ho! That song caught me when I saw them and I like it more and more every time I hear it. That was a classic from Chin Ho! I hope you enjoyed checking out the music of our town. Let’s do it again next week, shall we? Militants who seized large swaths of Iraq’s Sunni heartland with lightning advances this week have pushed into an ethnically mixed province and captured two towns northeast of Baghdad, officials said Friday as neighboring Shiite powerhouse Iran signaled its willingness to confront the growing threat. The fresh gains by insurgents, spearheaded by fighters from the al-Qaida-inspired Islamic State of Iraq and the Levant, come as Prime Minister Nouri al-Maliki’s Shiite-led government struggles to form a coherent response after the militants blitzed and captured the country’s second-largest city of Mosul, Saddam Hussein’s hometown of Tikrit, smaller communities, as well as military and police bases — often after meeting little resistance from state security forces. The fast-moving rebellion, which also draws support from former Saddam-era figures and other disaffected Sunnis, has emerged as the biggest threat to Iraq’s stability since the U.S. withdrawal at the end of 2011. It has pushed the nation closer to a precipice that could partition the country into Sunni, Shiite and Kurdish zones. The assault also threatens to embroil Iraq more deeply in a wider regional conflict, already feeding off the chaos caused by the civil war in neighboring Syria. Iran’s official IRNA news agency on Friday reported that former members of Tehran’s powerful Revolutionary Guard have announced their readiness to fight in Iraq against the Islamic State, while Iranian state TV quoted President Hassan Rouhani as saying his country will do all it can to fight terrorism next door. “The Islamic Republic of Iran will apply all its efforts on the international and regional levels to confront terrorism,” the Iranian report said Rouhani told al-Maliki by phone.